Covered hoppers are enclosed cars with various loading capacities based on the size of the car and are designed to handle bulk free flowing commodities including cement, food products, grain and grain products. These cars are top loading and unload through bottom openings. These cars can be lined or unlined depending on the requirements of the specific commodity. Pressure differential covered hoppers are pressurized and unload pneumatically. 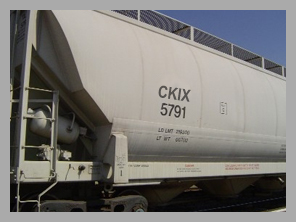 See tabs for specific covered hopper specifications.